The Girl Who Saved Ghosts is The Awakening of Sunshine Girl meets Dragonfly in Amber. 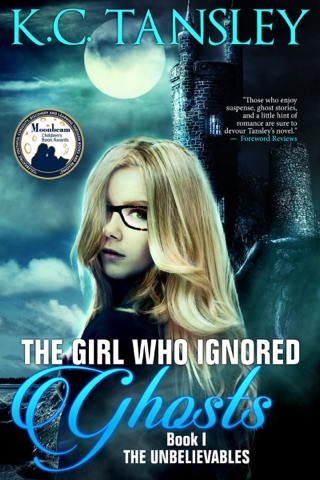 It’s a fast-paced YA time-travel murder mystery novel that combines paranormal and gothic elements to create a story full of ancestral legacies, powerful spells, unexpected connections, and inherited destinies. Second book in The Unbelievables series! The Girl Who Saved Ghosts by K.C. Tansley is the second book in The Unbelievables series. Kat Preston Langley is returning for her senior year at McTernan Academy with her best friend, Morgan Sanchez. The ghosts that wants their reckoning have followed her back to school. One young ghost named Ellie is covered in blood and asks Kat for her help. Kat is not sure how she can save Ellie and something more pressing captures her attention. Kat discovers that a sinister force called the Dark One is out to kill her. She needs training and the only people who can provide it are her two greats aunts (Jacqueline and Vivian) at Dumbarton. Kat along with Evan Kingsley travel to Dumbarton and meet with trouble as soon as they step off the train. The Dark One is testing their strength. To help Kat in the present, Evan and Kat need to travel back to 1831 Vienna to retrieve the Kingsley dagger. It is supposed to be a quick mission, but then Kat has a chance to help Ellie. Will Kat and Evan make it back to the present safely (let’s settle for alive) or will they meet their end in old Vienna? The Girl Who Saved Ghosts is the second book in The Unbelievables series and I suggest reading the series in order (otherwise, you will be a little lost). There are numerous characters and it can be hard to keep them straight. Those of you who have read The Girl Who Ignored Ghosts there are references to it that will help remind you of what occurred (it has been a year). I thought the pace was a little slower in this installment and the same details are repeated throughout the story (after a while I could recite them by heart). I understand Kat wanting to know her father, Max, but it got to be a repeated refrain. The Girl Who Saved Ghosts is a good story. Readers are given more details on the Langley heir and her relationship to the other three families. I wish there had been more action. The book leads up to Kat and Evan going back in time (once again) and it was such a short section (rich with historical detail though). I wanted more of the time traveling and supernatural aspect. 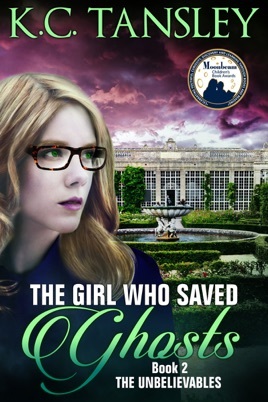 I am giving The Girl Who Saved Ghosts 4 out of 5 stars! The romance element is light (hooray) and the story is aimed at a young adult audience (adults will enjoy it as well). I am glad that the author excluded intimate relations and foul language from the story. The Girl Who Saved Ghosts is nicely written, has good characters, and has an intriguing mystery (you never know what will happen next). I appreciated the growth in Kat that took place during the course of the story. I am happy to see these changes in her. I want to know who is the Dark One and how will they stop him. I will be reading the next book in The Unbelievables series to find out what happens next.